The two police officers responsible for Stephon Clark’s death in Sacramento, Calif., on Sunday night shot him within three seconds of encountering him, according to video footage released by the Sacramento Police Department. Bodycam footage from one of the two officers, footage from the sheriff’s helicopter overhead, and the 911 call and dispatch audio were released Monday evening. In the helicopter video, a deputy can be heard guiding the officers to Clark’s location, behind his house, on his block. The officers approach his location, see him around a corner and begin firing within seconds. 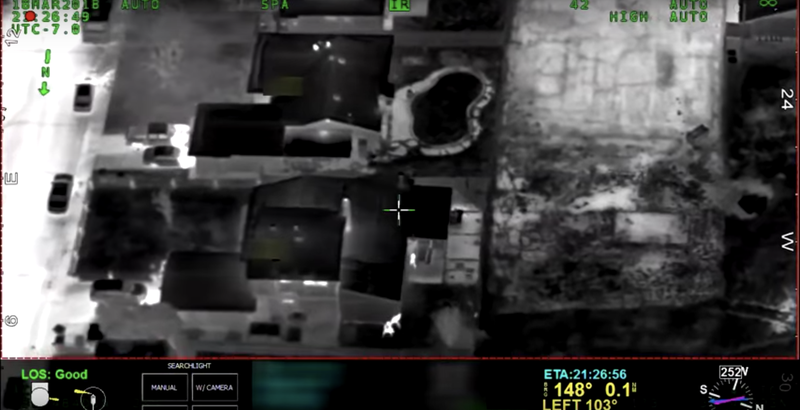 The helicopter video also shows the officers cowering behind a wall. Clark appears to be walking slowly through the yard and not charging toward them as police said in their statement. Even as Clark lies on the ground after being shot, both officers continue firing their weapons. Each shot at Clark at least 10 times. Once Clark is down and no longer poses a threat, neither officer moves to help him or start lifesaving procedures. The police officer bodycam footage shows us what happened on the ground. As soon as the officers spot Clark from their hiding place around the wall, we hear one of them yell, “Show me your hands! Gun! Gun! Gun!” and they both unload their weapons on him. They continue to yell for him to show his hands after he is down and no longer moving. He was most likely already dead, and they continued to yell at his lifeless body as if he were still a threat. Again, the video appears to contradict what police said in their statement. At no point in either video can we see Clark charging at officers with anything in his hands. Not from the sky, and not from their bodycam videos. This was another senseless execution of a black man at the hands of police. The videos are posted below, but be warned: They are graphic and may contain material that may be inappropriate for some viewers.